For the friend whose fur babies are everything to them—or for the neighbor who kindly checks on your fur babies when you're out of town—these chuckle-inducing 5"x7" pop-up birthday cards will most definitely brighten someone's big day. 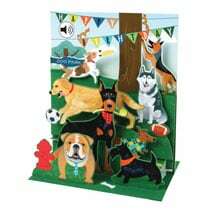 A party of pussycats is decked out for celebrating on our Singing Cats Happy Birthday Card, while our Singing Dogs Happy Birthday Card features a rambunctious crew of pups at the dog park. 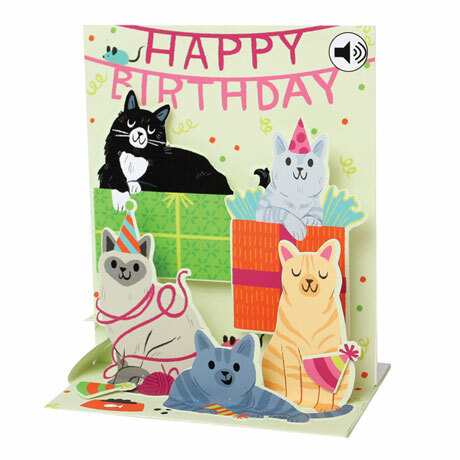 Simply press the button in the upper corner of the card to hear a feline symphony or canine choir meow or bark a birthday tune! A small tab lets you prop up the cute 3D cards for display, and the back of each offers ample space to pen birthday greetings. Card folds flat for mailing in included envelope (extra postage required).